Guitar scales are a very important part of learning the instrument. You don't realize how much information they can provide us in music. By knowing various types of scales, you can memorize the fingerboard, create interesting melodies and solos, even easily figure out the notes that make up a guitar chord. Heck, scales are critical to learn if you plan on doing any lead guitar work. So what is a scale? Well, think of it as a specific pattern of notes played in either ascending or descending order. When I say ascending, what I mean is the notes go up in pitch. Descending is the opposite - notes going down in pitch. If you're not sure what pitch is, think of the little ditty "Do, Re, Mi" from the "Sound of Music." Each note is a different pitch. 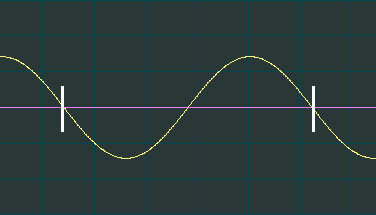 To go a bit deeper, pitch is based on the frequency of the sound wave for each note. Imagine the ripple in a pool after you drop a pebble in it. The pebble is the source of the sound wave and the ripples are the sound wave itself. The frequency is how many of the waves occur within one second. The more waves, the higher the pitch of the note. We use the term 'Hertz' to measure sound waves. For example, 1 Hz (Hertz) is equal to one wave per second (the image to the right shows 1 wavelength). We wouldn't be able to hear this because the lowest humans are able to hear is about 30 Hz. When we tune our guitars, we use the standard tuning of an A note at 440 Hz on our fifth string. Thats 440 waves per second, and that's still a pretty low pitch for guitar scales. Guitars are capable of playing pitches with frequencies in excess of 5000 Hz. That should give you a basic understanding of pitch. That sequence of notes, sung or played like in the Sound of Music, makes up the Major Scale. There are many different guitar scales we can talk about, and we'll get to the most commons scales soon. Before we get to the scales, we should first talk about intervals. Intervals are the spaces between notes. An interval could be the distance of one fret, or it could be the distance of twelve frets. Specific intervals played in different patterns form the scales that we'll learn, and the concept of intervals will become easier to understand as we look at the different guitar scales. I've decided to provide free guitar scales in downloadable PDFs so you are able to print them out. We'll start off with the Chromatic scale, then go to the Major and Minor scales. I'll also cover the Pentatonic guitar scales, which will come in especially handy when you want to play rock guitar. Getting a good handle on the various scales will give you a very strong foundation for both lead guitar work and learning your chords. Before we move on to the first scale instruction, let's have a short discussion of memorizing the fingerboard for guitar scales.